ENDOCHONDRAL BONE DEVELOPMENT | Microanatomy Web Atlas | Gwen V. Childs, Ph.D.
To orient yourself, first look for the primary ossification center in the diaphysis and move towards the epiphysis. 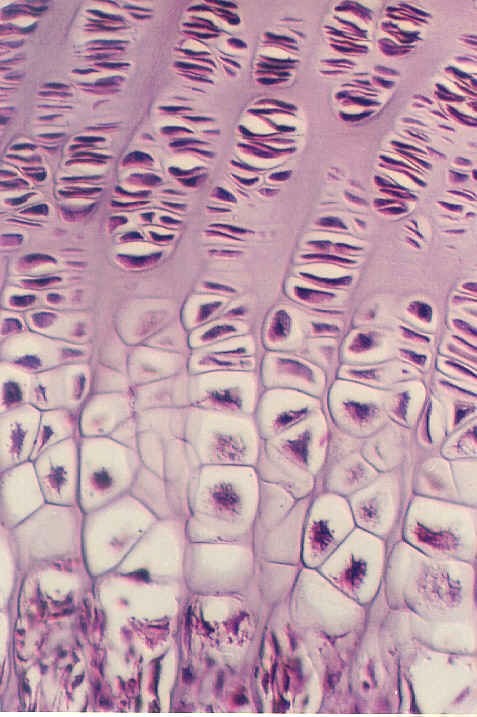 There you should see the epiphyseal plate which is an area of growth in long bones as well as endochondral bone development (from a cartilage matrix). Try to identify the zones in this photograph. 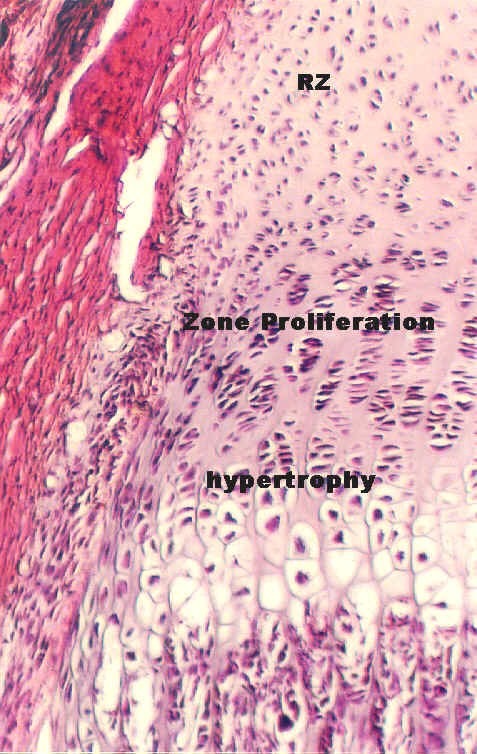 The top of this photo shows the resting zone (RZ) of hyaline cartilage. The next zone is the zone of proliferation, followed by the zone of hypertrophy. How is the zone of proliferation significant to the growth in length. What does the zone of hypertrophy signify? Higher magnifications of the resting zone (top) and the zone of proliferation (bottom) are shown in this photo. The zone of proliferation is responsible for the growth in length of long bones. This photo shows higher magnifications of hypertrophy and calcification. 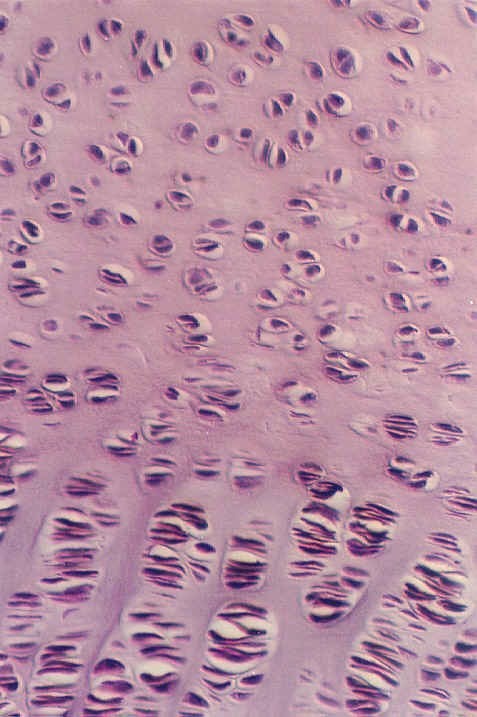 The chondrocytes die because the matrix no longer supports their nutrition needs. However they form the calcified cartilage model on which bone is laid. 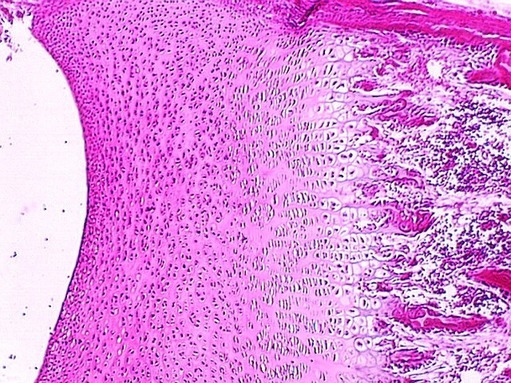 Osteoclasts invade and remodel the bony spicules. 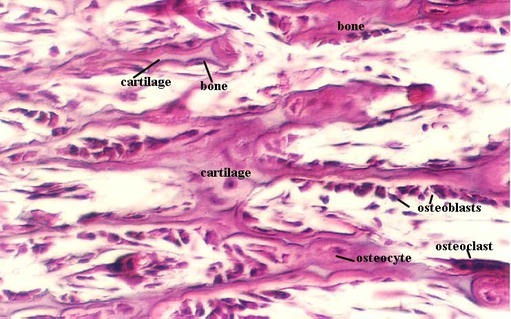 Osteoblasts line the outside and begin to lay down bone on the cartilage matrix. Look at the diaphysis showing new bone and identify the spicules of bone forming over the model formed by cartilage matrix. The cartilage matrix is purple-blue and the newly laid bone is bright red. This can best be seen in the higher magnification shown below. 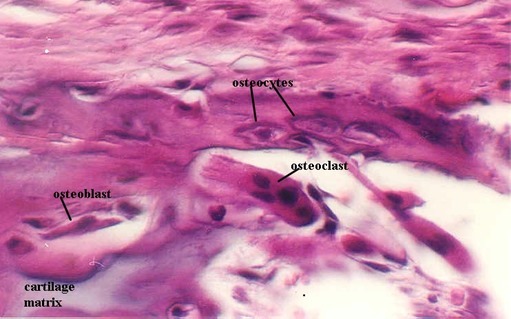 Once the osteoblast is surrounded by bone, it becomes an osteocyte.